2. Which of the following is necessarily true of safety critical systems? A. They are composed of multiple COTS applications. B. They are complex systems of systems. C. They are systems upon which lives depend. D. They are military or intelligence systems. 3. Identify all of the following which can be useful as a test oracle the first time a test case is run? 4. Assume you are a test analyst working on a banking project to upgrade an existing automated teller machine system to allow customers to obtain cash advances from supported credit cards. During test design, you identify a discrepancy between the list of supported credit cards in the requirements specification and the design specification. This is an example of what? 5. Which of the following is not always a pre condition for test execution? 6. Assume you are a test analyst working on a banking project to upgrade an existing automated teller machine system to allow customers to obtain cash advances from supported credit cards. One of the exit criteria in the test plan requires documentation of successful cash advances of at least 500 euros for all supported credit cards. The correct list of supported credit cards is American Express, Visa, Japan Credit Bank, Eurocard, and MasterCard. o American Express allowed advances of up to 1,000 euros. o Visa allowed advances of up to 500 euros. o Eurocard allowed advances of up to 1,000 euros. o MasterCard allowed advances of up to 500 euros. A. The exit criterion fails due to excessive advances for American Express and Eurocard. B. The exit criterion fails due to a discrepancy between American Express and Eurocard on the one hand and Visa and MasterCard on the other hand. C. The exit criterion passes because all supported cards allow cash advances of at least the minimum required amount. D. The exit criterion fails because we cannot document Japan Credit Bank results. 7. In many of the IEEE 829 templates, a section in one of the documents used early in the project lifecycle is related to a similar section in multiple documents used later in the project lifecycle. For example, an IEEE 829 test plan has a section called "Features to Be Tested," and you would expect to find each of the features listed in this section of the test plan to be listed in one or more of the sections called "Features to Be Tested" in all of the test design specifications. Which of the following statements best expresses another similar relationship in the IEEE 829 templates? A. Test case specification is to test procedure specification as test plan is to test design specification. B. Test procedure specification is to test case specification as test plan is to test design specification. C. Test case specification is to test item transmittal report as test plan is to test design specification. D. Test plan is to test item transmittal report as test plan is to test design specification. 8. Assume you are a test analyst working on a banking project to upgrade an existing automated teller machine system to allow customers to obtain cash advances from supported credit cards. The system should allow cash advances of at least 500 euros for all supported credit cards. The correct list of supported credit cards is American Express, Visa, Japan Credit Bank, Eurocard, and MasterCard. Assume that, in the following list, each test case requires exactly one hour of test analyst effort to run. Which of the following is a comma-separated, sequenced list of test cases that covers these risks in a way that is appropriate to the level of risk and that minimizes test effort? A. Test minimum American Express and Eurocard advances; test minimum Visa and MasterCard advances; test minimum Japan Credit Bank advances. B. Test minimum and maximum Visa and MasterCard advances; test minimum and maximum American Express and Eurocard advances; test minimum and maximum Japan Credit Bank advances. C. Test minimum Visa and MasterCard advances; test minimum American Express and Eurocard advances; test minimum Japan Credit Bank advances; test maximum Visa and MasterCard advances; test maximum American Express and Eurocard advances; test maximum Japan Credit Bank advances. D.Test maximum American Express and Eurocard advances; test maximum Visa and MasterCard advances; test maximum Japan Credit Bank advances. Which of the following statements matches each of these items with the risk management activity the item will most benefit? 10. Which of the following is a typical defect that equivalence partitioning would identify? 11. Which of the following is a typical defect that boundary value analysis would identify? 12. Which of the following is a typical defect that decision table testing would identify? 13. Which of the following is a typical defect that state-based testing would identify? 14. Which of the following is a typical defect that classification tree testing would identify? 15. Which of the following is a typical defect that use case would identify? 16. Which of the following is a typical defect that pairwise testing would identify? 17. Assume you are a test analyst working on a banking project to upgrade an existing automated teller machine system to allow customers to obtain cash advances from supported credit cards. The system should allow cash advances from 20 dollars to 500 dollars, inclusively, for all supported credit cards. The correct list of supported credit cards is American Express, Visa, Japan Credit Bank, Eurocard, and MasterCard. Assume that, in the following list of valid test cases, the first item in the parenthesized triple represents the credit card, the second item represents the amount to withdraw, and the third item represents the expected result. Which of the following selections gives a set of test cases that covers the equivalence partitions for credit cards and shows the correct expected result? 18. Assume you are a test analyst working on a banking project to upgrade an existing automated teller machine system to allow customers to obtain cash advances from supported credit cards. The system should allow cash advances from 20 dollars to 500 dollars, inclusively, for all supported credit cards. The correct list of supported credit cards is American Express, Visa, Japan Credit Bank, Eurocard, and MasterCard. The user interface starts with a default amount of 100 dollars for advances, and the ATM keypad is used to increase or decrease that amount in 20-dollar increments. Assume that, in the following list of test cases, the first item in the parenthesized triple represents the credit card, the second item represents the amount to withdraw, and the third item represents the expected result. Which of the following selections gives a set of test cases that covers the boundary values for cash advances and shows the correct expected result? 19. Assume you are a test analyst working on a banking project to upgrade an existing automated teller machine system to allow customers to obtain cash advances from supported credit cards. The system should allow cash advances from 20 dollars to 500 dollars, inclusively, for all supported credit cards. The correct list of supported credit cards is American Express, Visa, Japan Credit Bank, Eurocard, and MasterCard. The user interface starts with a default amount of 100 dollars for advances, and the ATM keypad is used to increase or decrease that amount in 20-dollar increments. Consider the decision table shown in table 1.0 that describes the handling of these transactions. Design a set of test cases that achieves this level of coverage with the minimum possible number of test cases. Assume each test case consists of a single combination of conditions to create and a single combination of actions to check. How many test cases do you need? 20. Assume you are a test analyst working on a project to create a programmable thermostat for home use to control central heating, ventilation, and air conditioning (HVAC) systems. You want to test the ability of the thermostat to properly interact with the central HVAC unit. At any given moment, the HVAC unit is in either an off state (the initial state) or an on state. The thermostat can send the HVAC unit either a start event or a stop event. If the unit is in an on state and it receives a stop event, it will always deactivate and display an "idle" message. If it fails to activate, it displays an error code associated with the condition that caused the failure to activate. Analyze these requirements to draw a state transition diagram for this thermostat. Use a separate state transition to show each failure-to-activate event/condition pair. A. There are two states and three transitions. B. There are two states and five transitions. C. There are five states and three transitions. D. There are five states and two transitions. A test must begin with the HVAC unit in the initial state. A test must complete when the HVAC unit returns to the off state from the on state. All tests can only complete with the HVAC unit in the off state. Design the minimum number of test cases possible. How many test cases did you design? 22. Assume you are a test analyst working on a project to create a programmable thermostat for home use to control central heating, ventilation, and air conditioning (HVAC) systems. In addition to the normal HVAC control functions, the thermostat also has the ability to download data to a browser-based application that runs on PCs for further analysis. Assume that you plan to use a classification tree to design the tests. You want to cover all possible pairs of operating systems with PC/thermostat connections because you are concerned about possible data transfer issues, but you only care that every browser be tested at least once. What is the minimum number of configurations you'll need to test? 23.Continue with the scenario in the previous question. Assume instead that you plan to use an orthogonal array to design the tests. You want to cover all possible pairs of options across all three possible pairs of factors. 24. Continue with the scenario in the previous question. Assume that figure 2.0 describes an informal use case for the data transfer feature. Which of the following statements (or some similar statement) would be found in a test procedure designed to cover one of the exception workflows in this use case? 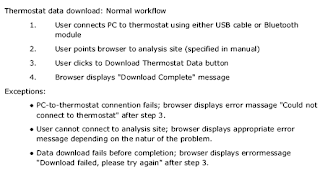 A. Click Download Thermostat Data button, wait for the "Download Complete" message, and then proceed to the Analysis workflow to verify the data. B. Click Download Thermostat Data button and immediately disconnect the USB cable or Bluetooth module. C. Click Download Thermostat Data button, wait for the "Download Complete" message, and then disconnect the USB cable or Bluetooth module. 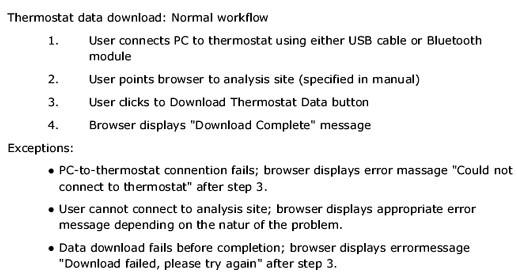 D. Click Download Thermostat Data button, wait for the "Download Complete" message, and then close the browser. 25. Which of the following statements captures a key difference between specification-based and defect-based test design techniques? A. Specification-based techniques derive tests from the structure of the system, while defect-based techniques derive tests from what is known about defects. B. Defect-based techniques derive tests from the structure of the system, while specification-based techniques derive tests from the behaviour of the system. C. Defect-based techniques derive tests from the structure of the system, while specification-based techniques derive tests from an analysis of the test basis. D. Defect-based techniques derive tests from what is known about defects, while specification-based techniques derive tests from an analysis of the test basis. 26. Which of the following is an example of the use of a defect taxonomy for test design? 27. Which of the following is an important principle for use of experienced-based test techniques? A. Tester skill is a critical factor in assignment of test execution tasks. B. Tester skills are less important than ensuring 100% tester utilization. C. Testers should always focus on defect-preventing activities. D. Testers should be evaluated based on the number of defects they find. 28. Assume you are a test analyst working on a project to create a programmable thermostat for home use to control central heating, ventilation, and air conditioning (HVAC) systems. In addition to the normal HVAC control functions, the thermostat also has the ability to download data to a browser-based application that runs on PCs for further analysis. Load various thermostat data sets to the application and evaluate the standard reports the application can produce. Which of the following statements is true and consistent with the approach to exploratory testing described in the Advanced syllabus? A. All actions associated with executing this charter should occur during test execution, after receipt of the initial test object. B. All of the thermostat data sets should be created prior to test execution, while all other actions associated with executing this charter should occur during test execution. C. Most of the thermostat data sets could be created prior to test execution, provided those data sets could be modified during test execution based on test results. D. All data, inputs, and expected results for this test charter should be specified in a concrete test case before the start of test execution. Force all possible incoming errors from the software/OS interfaces to the application. Which of the following is the kind of failure you are looking for when testing using this attack? 30. Assume you are a test analyst working on a banking project to upgrade an existing automated teller machine system to allow customers to obtain cash advances from supported credit cards. When the user first inserts a valid credit card type, the system considers the user to be in the unauthenticated state. Prior to requesting a cash advance, though, the user must enter the authenticated state. The user authenticates by entering the proper PIN. When authenticating the user, the system should allow the user to enter their PIN up to three times before failing the authentication and rejecting the card. On the first and second try, the system should prompt the user to reenter the PIN. Suppose you are concerned that, depending on the exact number of invalid PINs entered, the system might behave improperly. Which of the following test design techniques is specifically targeted at such failures? 31. If we say that a set of tests has achieved 100% structural decision coverage on a particular module in a program, what does that mean? A. That all bugs present in that module were necessarily revealed by those tests. B. That every control flow branch had been executed at least once by those tests. C. That every dataflow in that module was exercised at least once by those tests. D. That every path through that module was exercised at least once by those tests. Assume that, in the following options, each of the three numbers in parentheses represents the inputs for a test case, where the first number is a, the second number b, and the third number c. Which of the following gives a set of test case inputs that achieves decision coverage for this fragment of code in the minimum number of test cases? 33. Which of the following is a dynamic analysis technique related to improving application performance? 34. Set-use pairs are identified during which of the following static analysis activities? 35. Which of the following tests would address the interoperability of this application? 36. Continue with the scenario in the previous question. Which of the following tests would address the functional security of this application? 37. Continue with the scenario in the previous question. Which of the following tests would address the accessibility of this application? 38. Continue with the scenario in the previous question. Which of the following tests would address the usability of this application? 39. Which of the following is the best example of a reliability failure for an application? 40. Which of the following types of reviews is generally the most effective at finding the greatest percentage of defects present in the object being reviewed? Can you explain the answer for question 19? Hi, could you send me the test analyst dumps at m.filip@hotmail.it? Thanks a lot in advance. For 1st question, is it a right answer ? I think it should be C and D.
Component test and component integration test will be done for each system and it should be done before it is integrated with different systems and delivered. since there are two applications which needs to be integrated it should be system integration test and acceptance test. Can i have more sample exam papers please ? Can anyone tell me what are the 3 Rules of decision table? Thanks for sharing these questions. They are really helpful. I little update from my side. Question 31,32 , and 36 are not related to TA exam according to the 2012 syllabus. help share the exam on bisaya1kangdako@gmail.com. Thank you!